In this new feature, The Log looks at notable boats — sail and power — that continue to turn heads in Southern California harbors. Year Built: 1964. 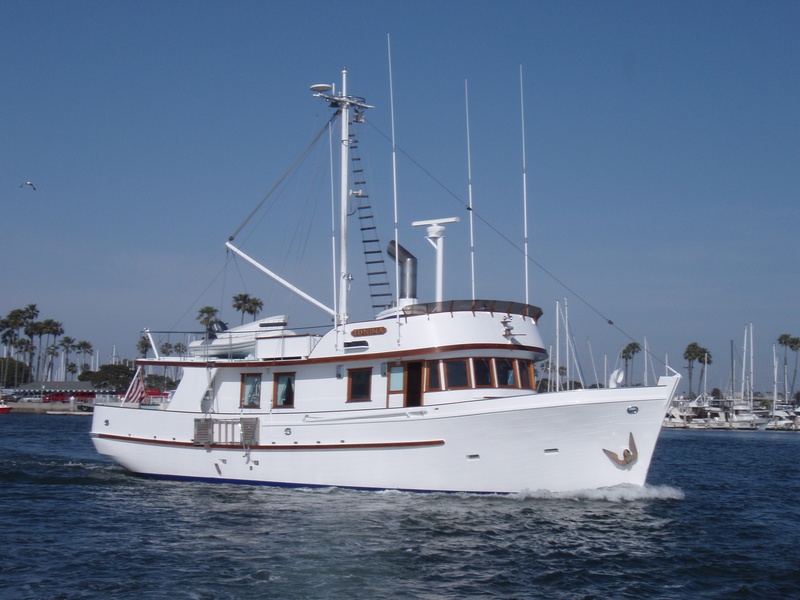 Tonina, one of the first long range trawler yachts, was built in Santa Barbara, Calif., by the Lindwall Boat Works, and designed by Art DeFever. She is an all weather boat, built for the founder of the RAND Corp., Frank Collbohm,” said Rick Fricke, the boat’s owner. When DeFever went on his own and started to build these yachts he designed these small yachts on full displacement hauls – real deep draft boats, Fricke said. “Lindwall built about 10 of them, each different sizes and kinds; mine was the biggest one that they did,” he added. Tonina has traveled to Alaska, Tahiti and Central America. “We have owned the boat for 26 years and have cruised her up and down the coast and Mexico,” he said. Notable Moments in Boat’s History: “She was on a television show called “the Deadliest Warrior” and in a movie called “Pleasure Cove” with David Hasselhoff,” Fricke said. Tonina has also been chartered for photo shoots for various women’s colognes. “Producers look for a certain type of boat, and once they have you on file you stay on there for years,” he explained. Famous Skippers Who Have Been Aboard: Tonina has been boarded by Donald Douglas, founder of Douglas Aircraft, Ted Conant, Douglas’ right hand man, Art DeFever and Paul “Sugar” Lindwall. “They buried Douglas off the back of the boat when he died,” Fricke said. “I’ve known this boat when I was about eight years old. It’s attracted quite a crowd over the years,” he said. “Sometimes I go somewhere and people I’ve just met tell me about how they’d cruised to Mexico on it in the past.” Recent Notes: “We’ve cruised her up and down the coast here but 99 percent of the time we’re over in Catalina,” Fricke said. Fricke remodeled the galley last year, changing the countertops from maple wood to granite with teak sea rails. He also added cabinetry and a new Italian range. Where Currently Berthed: Alamitos Bay, Long Beach, Calif.
Have a favorite yacht in your harbor that should be covered as a SoCal Classic? Email suggestions and/or photos to ambrosia@thelog.com or mail to: The Log, Editorial Dept., 17782 Cowan, Ste. C, Irvine, CA 92614.